Without question....this is it! This one wasn't well advertised, and glad to see Mark snagged it....I had been watching for a week......what a beauty. 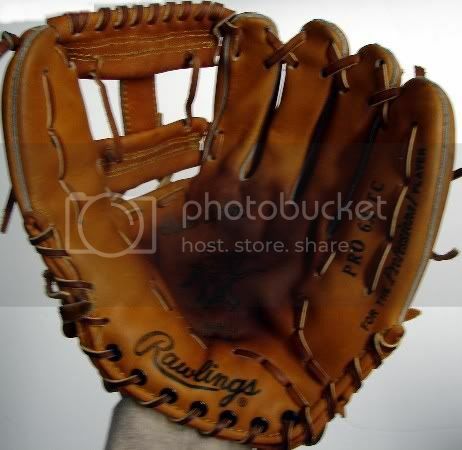 In a light week of buying and selling on ebay, this glove definitely stands out. The H web styling is one of my favorites and this is a great example. There are a couple of vertical strings connecting the two cross-sections of the web, maybe a custom effort for Evans' gloves. Looks like the seller should have listed under multiple headnigs, I'm also surprised that there was no reserve on an item like this. I've seen pics of Evans using this model and did notice the verticle laces on one of his well used gamers. It'll be interesting to see if the lace holes are factory or more likely added by a clubhouse glovedoctor.